A new family focused itinerary has been launched by Arctic and Northern Lights travel specialists, Off the Map Travel, for October 2017 where guests will come face-to-face with Arctic wildlife and hunt for the majestic Northern Lights across northern Norway and Sweden. From Arctic Norway, the new itinerary starts with a whale watching boat trip where humpback, orca, pilot whales, fin whales and the common porpoise are all possible to see. Not only will guests be looking above water with the help of an on-board marine biologist, but the boat is also equipped with a hydrophone to listen to their calls beneath the waves. The wildlife adventure continues with a visit the world’s most northerly wildlife park, Polar Park. Here the family can experience many of the Arctic region’s predators, and their prey, including brown bear, wolf, arctic fox, lynx, moose, reindeer, muskox and red deer. For those with older children, you can also include a Wolf Kiss, where guests get to meet socialised wolves face-to-face in a controlled and safe wildlife experience. The wildlife adventure continues with a visit the world’s most northerly wildlife park, Polar Park. Here the family can experience many of the Arctic region’s predators, and their prey, including brown bear, wolf, arctic fox, lynx, moose, reindeer, muskox and red deer. For those with older children, you can also include a Wolf Kiss, where guests get to meet socialised wolves face-to-face in a controlled and safe wildlife experience. Hunt for the Northern Lights in Finland from the warmth of an Aurora bubble sled towed into the wilderness behind a Snowmobile. This new experience in Kilpisjarvi, Finland, will see guests climb inside a comfortable, see-through, heated bubble that comfortably holds 2 people on beanbags and with plenty of blankets to keep them warm, and for those more adventurous visitors, you can also stay overnight in the Aurora Bubble Sled. Once comfortably settled into the bubble, it will be pulled behind a snowmobile into the heart of the Arctic wilderness from which guests can search for the magical Aurora Borealis. Exploring spectacular ice formations and the Northern Lights, all from your very own cozy igloo surrounded by spectacular ice formations, dramatic uninterrupted Arctic views and (hopefully) the Northern Lights. Not only is there an expertly, pre-built, igloo waiting as a base for the experience, but during the trip guests will learn how to make their own igloo and contribute to an ongoing igloo building project. Add to this the chance to explore and learn about magical ice caves and ice formations; catch dinner by ice fishing; listening to ancient stories about the Arctic; enjoying refreshments served in ice glasses and Aurora hunting from your remote Arctic igloo – and no matter what your age, guests will enjoy this true celebration of the Arctic’s frozen wilderness. Guests will get a true Taste of the Arctic with a local four course banquet cooked over an open fire in the middle of the Arctic wilderness all served in a locally built igloo. Prepared in front of them over an open fire by a trained chef and mountain guide, guests will learn about the local ingredients and how important they are for local cookery, whilst keeping one eye skyward for the Northern Lights as you eat. Local delicacies on the menu include dried reindeer meat and smoked reindeer heart with lingonberry compote; whitefish roe; Black crowberry slush; Arctic Char fried in butter with almond potato; Suovas (a lightly smoked reindeer roast) with juniper butter served with traditional flat bread; Aurora panna cotta served with cloudberries; and coffee with local cheese. The Taste of The Arctic can be added to any tailor made package in Bjorkliden and Abisko, but can be easily included into the Northern Lights Experienceitinerary, and is already included as part of the Grand Aurora. An indulgent VIP Arctic tour not only gives guests the personal touch and pampering that comes with the region’s best luxury lodge, but also the chance to experience the adventure and local culture of Lapland alongside expert private guides. The VIP Aurora Borealis Tour is a new travel opportunity for those who want an Arctic adventure, but are not willing to compromise on quality or comfort. Although the new VIP Aurora Borealis tour itinerary includes the chance to drive a dogsled, go ice fishing, ice carving, reindeer sledding, snowshoe trekking, a snowmobile safari, a private Sami reindeer experience and private behind the scenes tours at the world famous ICEHOTEL, this is tailor-made for each guest. A new immersive itinerary to experience the Arctic and hunt for the Northern Lights as the indigenous Sami people have done for thousands of years. The Sami Arctic Experience itinerary is not just a journey through Arctic Norway and Sweden, but is a journey through the nature, culture, food, history, and myths that make up the Sami way of life. Guests will try their hand at reindeer herding; hunt for the majestic Northern Lights; eat traditional Sami food; go for an Arctic walk in nuvtthaga, traditional Sami shoes; visit Sami communities and families, and stay in a traditional Sami lavvu tepee. See both sides of the Arctic including two separate trips to Lapland staying in a hand crafted ice bedroom on both the longest and shortest days of the year – all now possible due to the new ICEHOTEL 365 experience just launched. This new double adventure includes two separate trips to the Arctic. The first trip on the shortest day of the year (21st December 2017) when the sun doesn’t break the horizon with dog sledding and arctic activities all possible, and the second during the Midnight Sun on the longest day of the year (June 21st 2017) with 24 hours of sunshine enjoying the local walks and cycling, both of which will include a night in an art suite made entirely from ice. The Aurora Festival is once again set to ‘blast off’ in January 2017 with leading scientists joining in a celebration of the Northern Lights which will this year teach guests to be Northern Lights ‘rocket scientists’. Bringing together Aurora experts, space physicists and guests from around the world to Bjorkliden and Abisko, deep within the Arctic circle, to celebrate the Northern Lights, take part in a range of experiments and activities and to better understand the science and research around the Northern Lights. This year a new luxury Northern Lights for the Soul experience has been launched to allow guests to experience the spiritual side of the Aurora Borealis through a complete mindfulness journey using the Northern Lights, yoga and meditation to gain confidence and a greater sense of self-worth. The new retreat is based at the luxury Malangen Resort in Tromso, Norway, perfectly positioned on the bank of the fjords with spectacular views of the coast and surrounding mountains. Running in March 2017 and will combine yoga, Tibetan yoga and mindfulness meditation delivered by masters of their craft from across Europe. 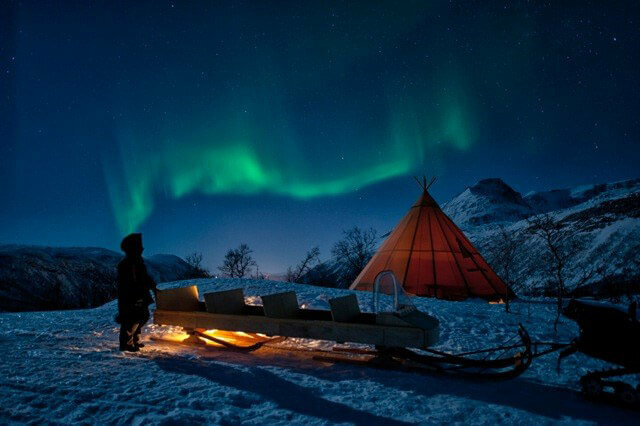 A new ultimate Scandinavian Northern Lights adventure has been launched with Northern Lights hunts from a luxury catamaran, atop spectacular Arctic mountains, from an igloo, traditional Swedish Lavvu and Finnish Kota. The new fully guided itinerary is not just about the Northern Lights, it’s also a celebration of culture, food and nature across the Arctic region. This complete adventure has left nothing out. From meeting native Sami reindeer herders; top chefs showcasing Sweden and Finland’s best food; a train journey reputed to be one of the most spectacular in the world; dogsledding, snowmobiling, ice fishing; a visit to the original ICEHOTEL, and a spectacular helicopter transfer over Europe’s last true wilderness, every Arctic dream can be achieved on one trip. Remember, as we always tailor-make our itineraries, you can mix and match any of the activities across the Arctic Europe region in one trip across Norway, Sweden, and Finland. Contact one of our Aurora travel experts today to find out more.